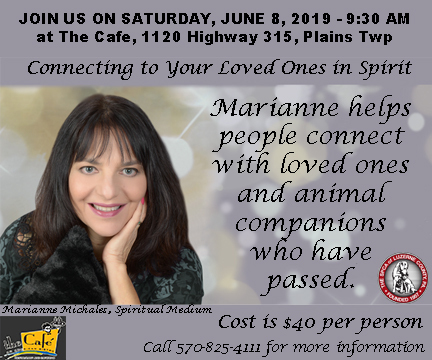 Join us on Saturday, June 8, 2019 from 9:30 to 11:30 am at The Cafe for a morning with Spiritual Medium - Marianne Michaels. Marianne helps people connect with loved ones and animal companions who have passed. Marianne is one of the nation's most respected and dedicated spiritualists. Her work helping people to communicate directly with their loved ones on the other side and to reconcile their lives after loss is redefining the traditional role of the spiritual medium. Reservations are required. Space is limited. If you would like to make your reservation by mail please send check with a note that includes your contact information (name, address and phone number), who will be attending (be sure to include all guests names) to SPCA of Luzerne County, 524 East Main Street, Wilkes-Barre, PA 18702. Marianne Michaels will have her book for sale at the event. For more information about Marianne, please click the link below.